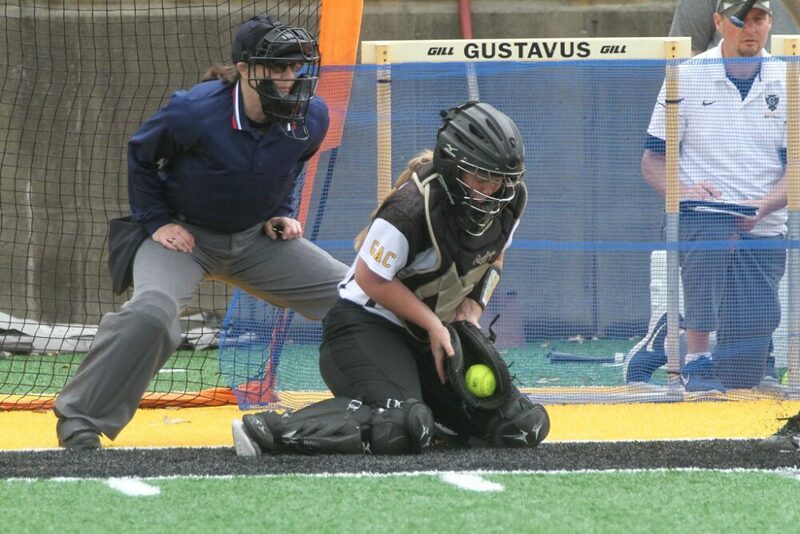 DECORAH, Iowa – The Gustavus softball team traveled to Luther College to take on St. Catherine this afternoon where they split with the Wildcats, winning game one 6-5 before falling in game two 7-4. With the results the Gusties move to 13-15 overall and 4-10 in the MIAC. In game one, St. Catherine struck first, plating a run in the bottom of the first to take a 1-0 lead. The game went scoreless until the top of the third, when the Gusties did all of their damage, plating six runs. Gustavus got RBI’s from Caitlin Kammerer (Jr., Watertown, Minn.), Freeman, Marissa Marsolek (So., Savage, Minn.), and Xandra Zachman (Fy., Saint Peter, Minn.), before a 2-RBI double by Ashley Beise (Sr., Loretto, Minn.) capped off the inning. The Wildcats would take four runs back in the fourth inning to pull the game within one but Neuenfeldt came in and shut the door the final two innings, allowing no hits in the save. Freeman started on the mound and recorded the victory, going five innings, allowing five runs, and striking out four. In game two the Gusties struck first, scoring two runs in the first inning before St. Kate’s started to get the bats going. The Wildcats got one run in the second and third before scoring two runs each in the third and fourth to take a 6-2 lead. The Gusties got one back in fifth but St. Kate’s answered it in the bottom half of the inning to hold a 7-3 lead. Gustavus got one more run in the seventh inning but fell short, losing 7-4. The Wildcats outhit Gustavus in game two by a margin of 10-4. Neuenfeldt led the Gusties at the plate, with two hits and a walk, along with two RBI’s and a run scored. Kenzie Skuza (Fy., Princeton, Minn.) also had a hit and RBI, while Sydney Swenson (Fy., Chaska, Minn.) had the fourth Gustavus hit. Neuenfeldt took the loss on the mound, going five inning and allowing six runs, just two of which were earned. Amara Packey (Fy., Fridley, Minn.) threw the final inning for the Black and Gold, allowing one run. The Gusties will next be in action on Tuesday when they travel to Macalester for a doubleheader beginning at 4:30 p.m.